Commerce and communication aside, the chief value of the internet is that it is HILARIOUS -- but with so much stupidity available, how is the average point and clicker supposed to take it all in? 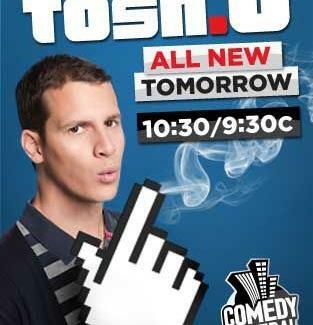 Let Tosh.0 make sense of the madness when it returns with all-new episodes, Wednesdays @ 10:30/9:30c on Comedy Central. Hosted by standup comedian Daniel Tosh -- your personal screen savior -- Tosh.0 takes a wry look at the very best of the internet's worst. Among the crucial topics covered have been racism, competitive cup-stacking, and the challenge of "blurring" Demi Moore's bountiful 1980's womanhood. But just because Tosh.0 is determined to search and destroy, doesn't mean there isn't time for Web Redemptions: chances for the medium's most tormented goats to make good, by, say, not puking on a local television show, or landing feet-first instead of face-first on that ninja flip. To get a taste of Tosh.0, hit the Comedy Central site and check out videos like "Web Redemption: Crying Sorority Girl" -- in which you'll learn that the chiefest value of the internet is getting to watch a guy in short shorts frolic with a dude in a penguin suit.